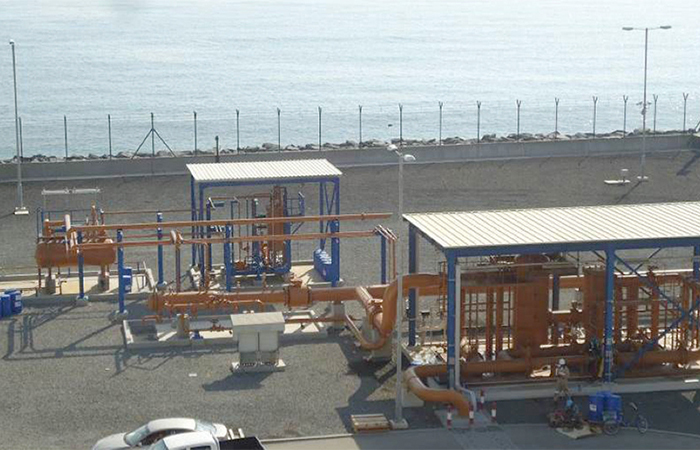 The FUJAIRAH F2 Power and Desalination Plant (the “F2 Plant”) is located in Fujairah (UAE) and it is gas-driven and uses diesel as back-up fuel. The back-up fuel has to be supplied by ship for which the installation of a new SPM (Single Point Mooring) and onshore receiving system is envisaged. The SPM is to be located 3 km seaward of the existing F2 Power and Desalination plant, where the water depth is around 40 meters and will form part of the Port of Fujairah SPM master plan. The F2 power plant is located at Qidfa, about 15km North of the Port of Fujairah in the UAE. Tecnoconsult scope has been relevant to the design, pre-commissioning and commissioning procedures and assistance to Vendor bid evaluations and follow-up of the SPM and undersea pipeline (trenched and backfilled). Onsite services to assist the Client during start up activities.